Wed., June 17, 2015, 12:21 p.m.
Read the report issued by the City of Spokane after an investigation into allegations Rachel Dolezal and other Police Ombudsman Commission members violated the city’s Code of Ethics. Read the letter Mayor David Condon and council President Ben Stuckart sent to Rachel Dolezal asking her to resign. The actions of former NAACP chairman Rachel Dolezal and two other members of the Office of Police Ombudsman Commission threatened that group’s impartiality and effectiveness, a city investigation has found. In response Spokane Mayor David Condon and Council President Ben Stuckart have called on all three members to resign. 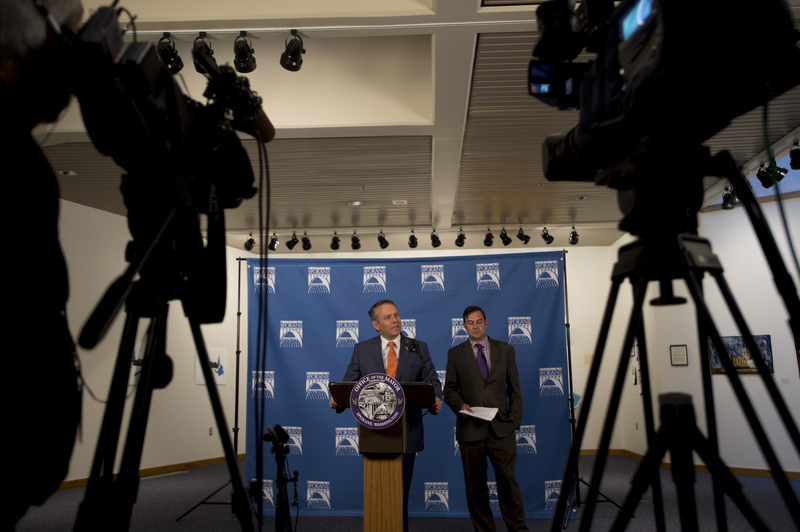 In a news conference today, Condon and Stuckart said the three leaked sensitive information about police misconduct investigations. The other two commissioners investigated are Adrian Dominguez and Kevin Berkompas. — The trio tried to overstep the commission’s authority and perform investigative duties after the city’s ombudsman Tim Burns resigned and left in January despite warnings from other commissioners. — The commissioners sought to conceal vote counts to give the false impression that the panel unanimously backed certain issues despite some commissioners wanting their votes listed. — Meeting minutes were altered to exclude references to comments and activities that had occurred. The investigation concluded that the three commissioners also mistreated city staff. If all three commissioners named in the investigative findings were to be removed, it would leave the new commission unable to function because it wouldn’t have enough members to approve anything. With Burns gone, the commission has been trying to hire a new ombudsman and was supposed to begin interviewing interim candidates this month. Even before today’s news conference, pressure was mounting on Dolezal to resign her post as chairwoman of the ombudsman commission. The city’s Human Rights Commission formally called Tuesday night for her to step down. Read the letter Mayor Condon and Council President Stuckart sent to Dolezal, asking her to resign. Dolezal, who is white but has been portraying herself as a black woman for years, resigned Monday as head of the Spokane NAACP chapter. One of the commissioners, Scott Richter, told two city council members months ago that he felt Dolezal was unable to separate her advocacy role as head of the NAACP and the need to provide impartial police oversight as head of the Ombudsman Commission. According to an email included in the report, Richter thanked Waldref and Fagan for communicating his complaints about his colleagues to Mayor David Condon, noting that Dolezal and Berkompas were appointed to the commission by Condon. But Condon canceled a subsequent meeting with Richter. “In short, I hold the mayor 100 percent responsible for what is happening (both the HR aspects and allowing the OPOC to run amok of the ordinance),” Richter wrote. Commissioners were named to the ombudsman commission in August 2014. Berkompas is a retired Air Force colonel and Dominguez is an epidemiologist at the Spokane Regional Health District who recently announced he’s leaving the area to take a job in Western Washington. Richter is the community indicators project manager at Eastern Washington University and a former intern in the ombudsman’s office. Also named was Debra Conklin, 61, a pastor at Liberty Park United Methodist Church. Dolezal and Berkompas were selected by the mayor as at-large commissioners. The remaining three were chosen by City Council members, each representing a council district. The commission was formed to provide independent oversight of the city’s police ombudsman, who reviews internal investigations into police misconduct. The ombudsman position was created following disclosure of the department’s sloppy and incomplete investigation into the role of its own officers in the fatal 2006 confrontation with Otto Zehm, who had been erroneously implicated in a theft and beaten, shocked with a Taser and hogtied by officers in a convenience store before dying in police custody. Richter, in his email to Waldref and Fagan, said the dysfunction on the ombudsman’s commission threatened its mission as well as that of the police ombudsman. “I personally wish the (commission) would be disbanded or at least put a moratorium on all of the OPOC’s activities until this mess can be sorted out,” he said. Published: June 17, 2015, 12:21 p.m.